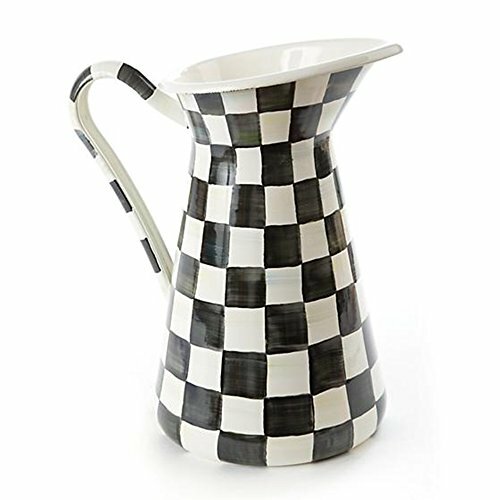 For lemonade, iced tea-or better yet, a blend of both-nothing beats our Courtly Check® Enamel Practical Pitcher. The hand-painted black and white checks are woven with jewel tones for a refreshing way to integrate everyone's favorite pattern into the everyday. Make every day extraordinary with Courtly Check Enamelware. If you're thinking "classic" as in "black dress and pearls" or "white tie and tails," think again! We've added sass to the traditional color combination in our signature color-dragged, hand-painted pattern. Dressed up and styled out, it's black and white our way. Very classy-with a kick! Heavy-gauge, hand-glazed steel underbody with hand-painted Courtly Checks. Pieces may vary due to the handmade nature of each product. Imported.